Fronts 2 RF-7 iii, Center RC-64 iii, 2 Surrounds RP-250 S , 2 Subs R-115 SW, 2 In-ceiling Speakers came with the house believe they are Martin Logan , Denon 4400 H Sounds good am concerned may be underpowered. Was advised to get an Amplifier, looking for feedback as to what is recommended? Feedback and comments are highly appreciated. The best tarps are bought from harbor freight in the weekends son. Let's start here... how my yenom do you have budgeted? Let's﻿﻿ start here... how my yenom﻿ do you have budgeted﻿﻿﻿? Two shunyaya Power cords. Is that good enough? Long live shunyaya. Let's﻿﻿ start here... how my yenom﻿﻿ do you have budgeted﻿﻿﻿? I figure around 1500 for an Amp. Would you consider a used amp? Definitely more bang for the buck. Sure if the price and condition are worthy of consideration, Yes. Here is a great choice. A bit more than your $1500.00 but with an MSRP of over $5000.00 it would be a steal. My guess is that maybe only a few years old. If I was in the market I would not hesitate. VERY well known company. They price things aggressively. Doesn't hurt to call them..
5 channel to 7 channel stand alone amp is right on the edge of that pricing. If you don't consider an avr as a basis for you HT duties, how are you planning to compensate for room nuances and sound processing? Monoprice monolith amps. They now have xlr connections. Basically a rebadged ATI for way less. Thanks will check with them. I have bought a few items from them and can't recommend them enough. I'm in a similar situation, I'm in the middle of a basement build project and I want to setup 9.2 Dolby Atmos. I have two RP-8000F front speakers, an RP-450C center, two RP-140SA atmos speakers, a series of smaller rear surrounds, and two Klipsch 12" powered subs. My question is, when I purchase an amp how to connect them? My quarterback is a Marantz SR7011 but I want to provide additional power to my setup. 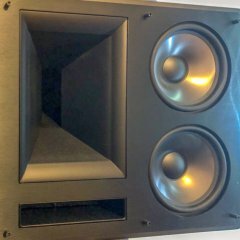 I'm looking at multiple Emotiva XPA amps and wonder do I need to power ALL 9.2 of my speakers or just the front 5 for optimal results? For example should I purchase two XPA5's or is that overkill? Is the juice worth the squeeze in amplifying smaller speakers? Or should I focus on just feeding the beasts? I've searched the web for 3 days and cannot seem to find an actual DIAGRAM on how to connect the head unit to the amp or how to group the speakers? People always take pics of the front of their media cabinets which is about freakin' useless. I need to see the actual setup in the back. YouTube tells you all the specs on the amps, but nobody shows you HOW THEY HAVE THEM CONNECTED? Is it just me? The amp connects to the pre-outs on your receiver, via RCA’s. Eazy peazy! if I were in your shoes, I’d just get a 5 or 7 channel amp and let that nice receiver drive the other speakers. Or at a minimum a 3-channel to drive your front soundstage(L-C-R).